240 fundraisers from around 3 dozen countries under one roof! It is exciting to see such a big surge of fundraisers in India. And these are not only from India but from around 3 dozen countries around the globe. The gathering has been made possible because of the 9th International Workshop on Resource Mobilisation being held at Infosys Campus in Bangalore from June 25-28, 2009. It is such a pleasure to share with the really deserving grass root NGOs, who seem to be wanting more and more. I will like to thank the 60 odd people who attended my session on "Fundraising face-to-face, on the phone and through Tele-facing...on a small budget". For the others who could not make it to the session or the workshop the presentation is right below. View more documents from anuptiwari. Many of us will meet at the Resource Alliance's big fundraising platfrom 9th IWRM at Bangalore (from June 25-28th, 2009). Believe me it will be a great fun. I am here in uploading a presentation that may interest you all. It is based on my experience with few of the leading fundraising organisations in India. Click through the slides and comment if you agree or otherwise. 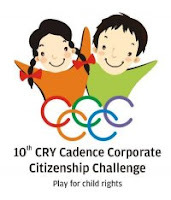 One event that has proved to be a real cash cow for the cause of children is CRY Cadence Corporate Citizenship Challenge. Started 10 years back, the event was born out of a failed fundraising event. Around 11 years back Cadence had supported a quiz for school students being organised by volunteers of CRY. Although, the event called FACT School Quiz, witnessed sleek quiz mastery by Roshan Abbas, not much money came out of it. With all credit due to the Cadence team, instead of being miffed about the failed event, they popped up the idea of a Corporate Cricket Challenge to raise funds. The idea appeared queer, but worth testing. The journey to the launch event was not easy as the dozen teams that played in year one were hard to come by. But soon things fell in place and rest as it is said is history.Although, I was associated from year one to four, but always kept tab on the event as it attained great heights. Click on the link below to know more. An interesting concept to adopt and an interesting lesson too. Do not despair if your fundraising event fails, there may be success lurking in the corner. There are two programmes that can make immense sense to NGOs who desire to market their organisations and fundraise on their own. The first one is being organised by the prestigious Management Development Institute (MDI) in Gurgaon. The course titled "Strategic Marketing for Social Sector" has a special discounted pricing for few deserving NGOs. So better click below and enroll. 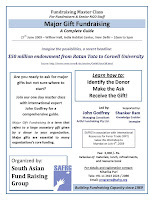 The second one titled Major Gift Fundraising is being organised by SAFRG and is on acquiring high value donors, an area that needs serious development in Indian fundraising arena. The details on the programme are as below. Clcik on the image to enlarge and enrol. Thanks for attending the masterclass. Please find below 3 of the 4 presentations made on the day. The fourth presentation from George Hla would be uploaded soon. Meanwhile happy acquiring and renewing donors.